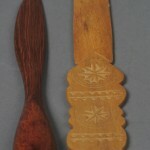 Harmon was an undergraduate intern who assisted in the curation of gallery and web exhibitions. She studied English, History, and Spanish. In 2008, John Fowles’s widow shipped to the Ransom Center 90 boxes of the writer’s manuscripts, books, and personal effects to be added to the author’s extensive papers, the bulk of which were acquired in 1991. Among the items received was Fowles’s writing desk, complete with its contents. On March 31, 2011—Fowles’s 85th birthday—the desk will be placed on display in the Ransom Center’s Reading and Viewing Room, where it will remain for at least the next two years. It joins the desks of Edgar Allan Poe and Compton MacKenzie, which have been on display since the room opened to researchers in 2003. 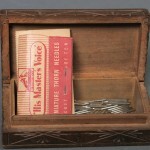 Fowles’s desk will be displayed with drawers open to reveal a selection of its fascinating contents. 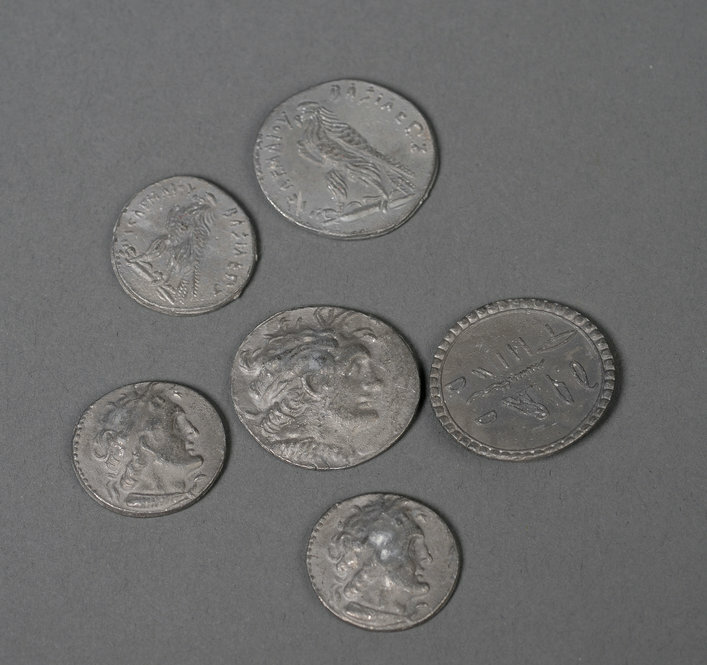 As an undergraduate intern at the Ransom Center, I was given the opportunity to sort through the desk and its contents in preparation for their display. The two-drawer desk is spartan and well-loved, its surface marred by cigarette burns, its left drawer marked with addresses and phone numbers in Fowles’s hand. 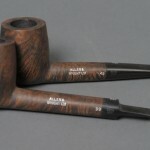 The contents range from dried seeds and paleontology slides to a pair of brass knuckles. After spending an afternoon sifting through the desk’s contents, I was hooked. Who was this man who kept a pair of brass knuckles next to his slides of Ammonite-Spinokosmoceras? Unfamiliar with Fowles’s work, I looked to The Magus for an introduction and saw echoes of Fowles’s desk and its contents throughout the novel. A handful of Greek coins in the left drawer recalled the novel’s setting on a Greek island, while one especially suspenseful scene in the first half of the novel reminded me of a mysterious, single black and gold die. 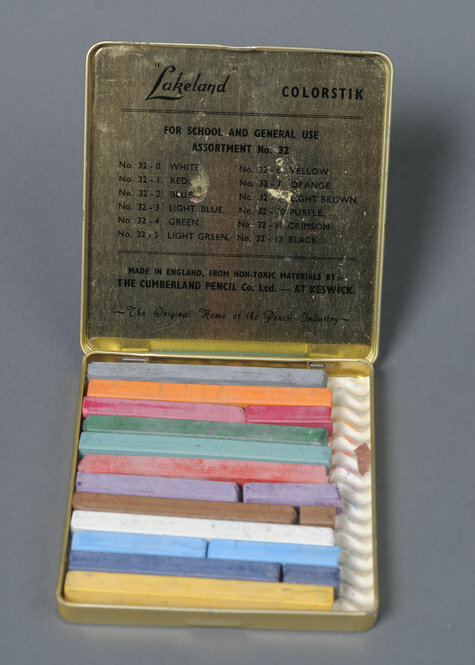 As I became acquainted with Fowles’s other novels, I saw reflections of his writing in further items from his desk; among other things, the typewriter ribbon canisters stamped “Lyme Regis” recalled The French Lieutenant’s Woman. The contents of John Fowles’s desk, then, are at once material and literary. 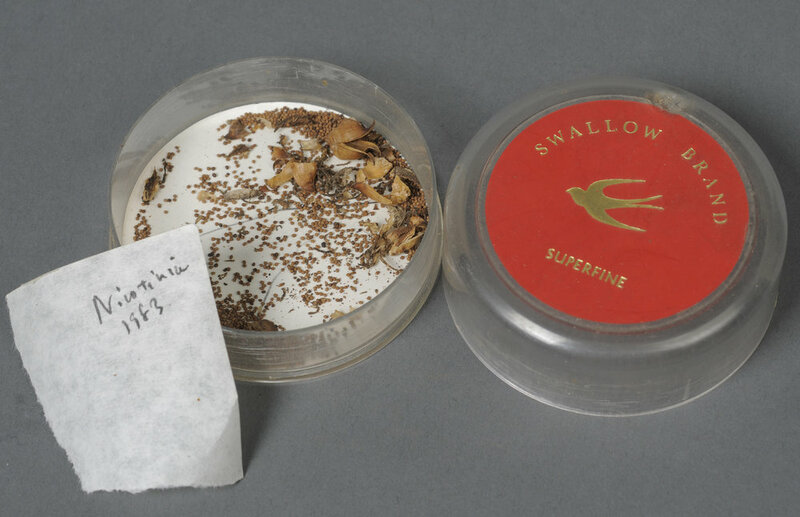 The Center’s John Fowles papers are rich with research opportunities, but the desk provides us with something more: a glimpse into the physical objects from the writer’s life that, at times, seem to coincide with moments from his many novels. 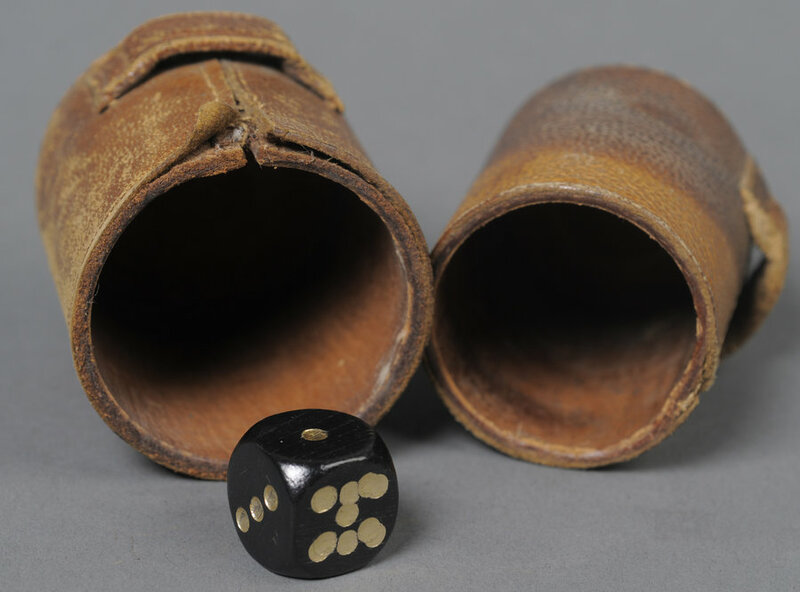 Some of the contents of the desk are mysterious and intriguing, and others, like the staples and empty eyeglass cases, are simply the vestiges of any ordinary man’s life. The entire contents of the desk are listed below. 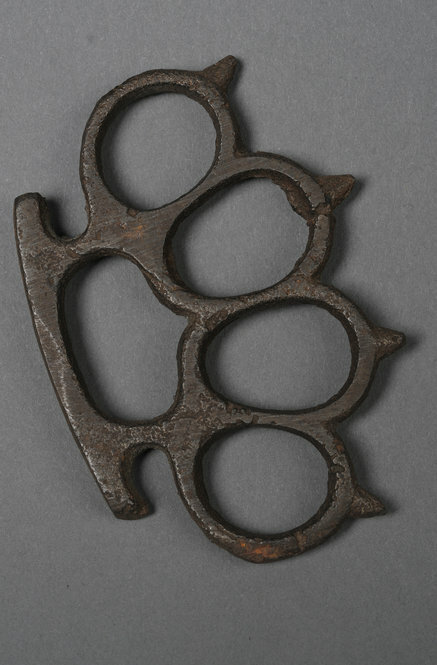 I’m still unsure as to whether or not any of Fowles’s novels can explain the brass knuckles, but I’ll keep reading in hopes of finding some clue. Two invitations to “A Tribute to John Fowles, Patron of Town Mill” in Lyme Regis, Saturday 13 December 2003, 6–8 p.m.
Tippa model typewriter made by Adler. 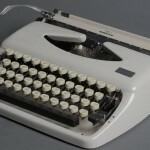 This is one of three Fowles typewriters at the Ransom Center. Photo by Anthony Maddaloni. 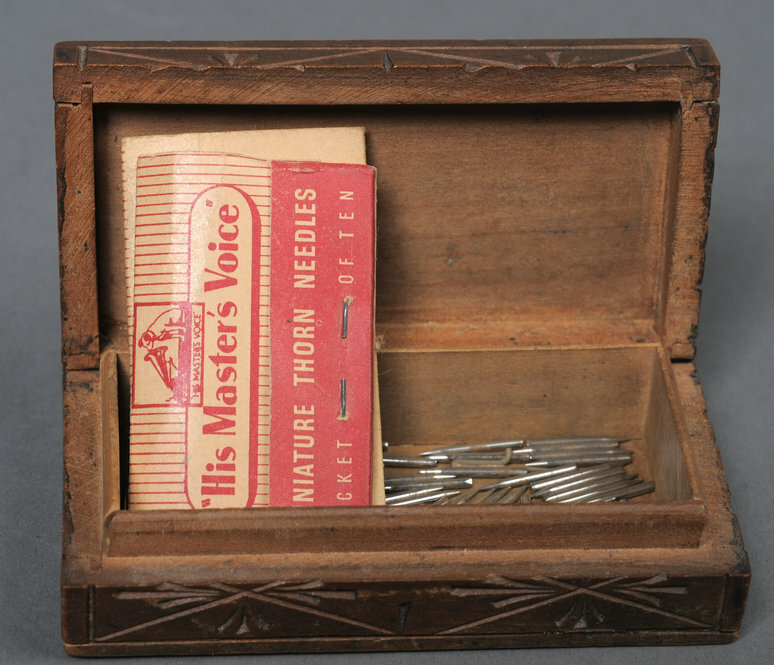 Carved wooden box containing two packs of “His Master’s Voice” thorn needles and loose steel needles, for use in a record player. Photo by Anthony Maddaloni. 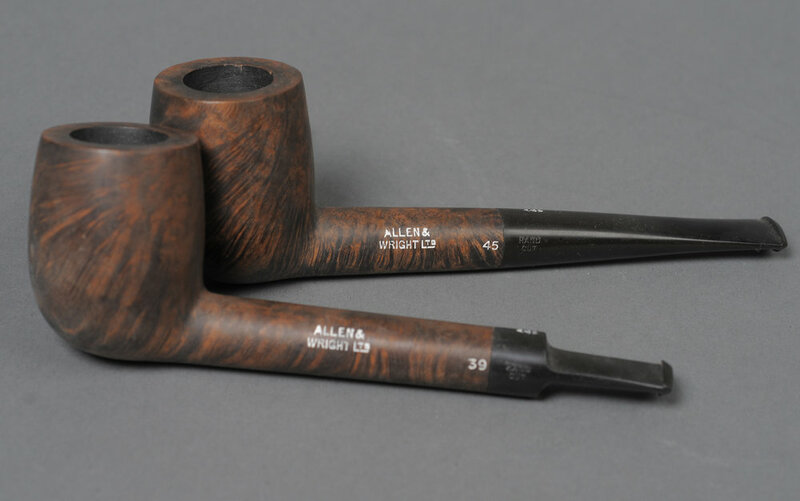 Two pipes made by Allen & Wright Ltd., where Fowles’s father was employed. Photo by Anthony Maddaloni. 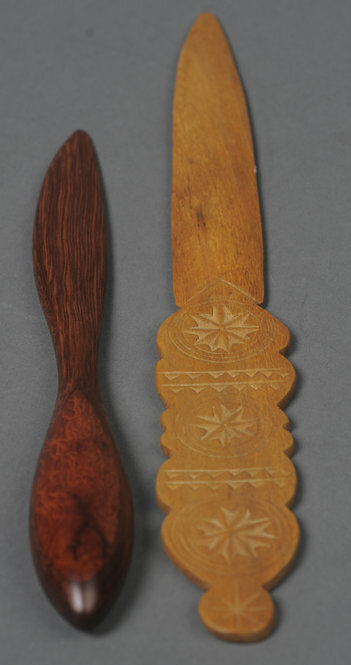 Wooden letter openers. Photo by Anthony Maddaloni. 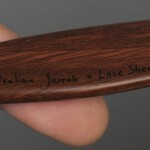 Close-up of wooden letter opener with inscription. Photo by Anthony Maddaloni. 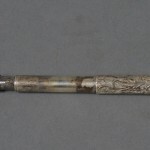 Sterling silver fountain pen. 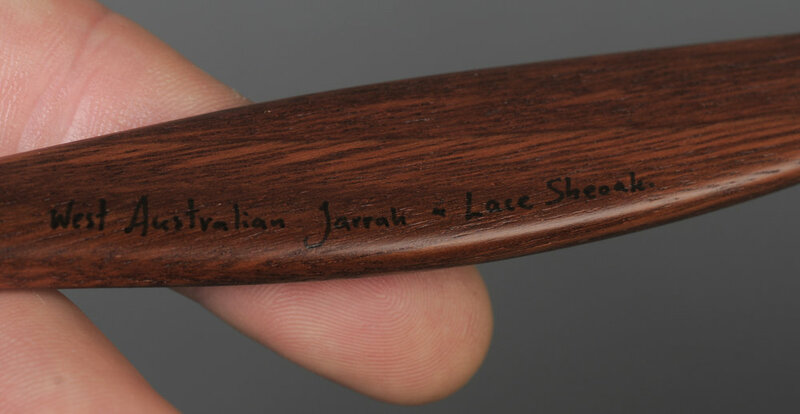 Nib is inscribed with the letter “J.” Photo by Anthony Maddaloni. 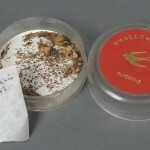 Plastic typewriter ribbon canister with dried seeds and petals and a scrap of paper, inscribed “Nicotinia 1983.” Photo by Anthony Maddaloni. 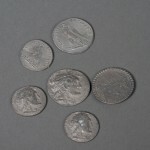 Six silver Greek coins. Photo by Anthony Maddaloni. 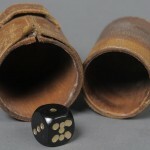 Die with leather shaker. Photo by Anthony Maddaloni. 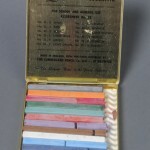 Tin of Lakeland Colorstick pastel pencils. Photo by Anthony Maddaloni. 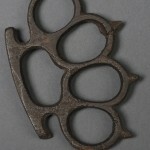 Brass knuckles. Photo by Anthony Maddaloni. 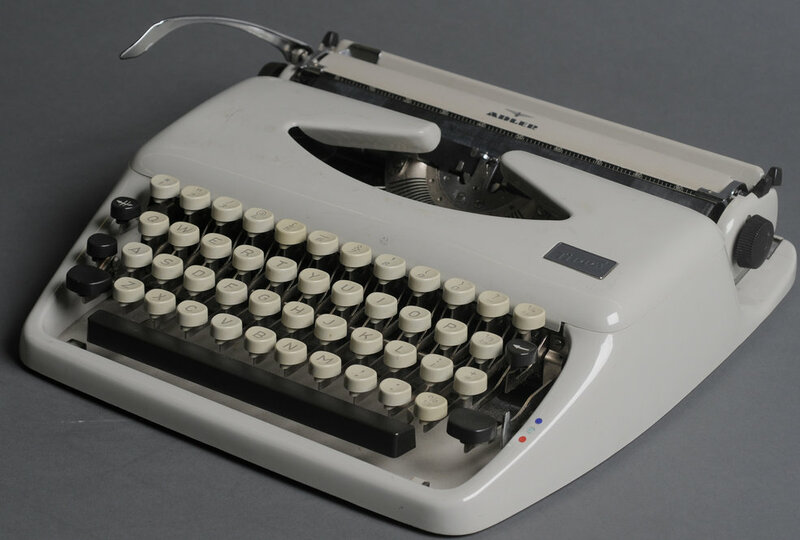 Image: Tippa model typewriter made by Adler. This is one of three Fowles typewriters at the Ransom Center. Photo by Anthony Maddaloni.